Chronic pancreatitis is a widespread disorder that manifests itself as a chronic or intermittent pain, along with symptoms of impaired excretory and incretory (endocrine) functions. This disorder is characterized by irreversible changes to the pancreatic parenchyma (tissues of pancreas), which includes dystrophy of pancreas, disappearance of pancreatic acini, proliferative fibrosis (fibrous elements keep on proliferating even after the causative factor has disappeared), stricture of pancreatic ducts, and formation of concrements within the ducts. Chronic pancreatitis can often have very few symptoms, or it can be masked by other disorders of the gastrointestinal tract, such as chronic cholecystitis, biliary dyskinesia, peptic ulcer disease, and gastroesophageal reflux disease. Thus, it is impossible to assess the real frequency of this disorder. Chronic pancreatitis is usually caused by factors that are present for a long period of time (for example regular consumption of alcohol). However, it can also result as a complication of an acute pancreatitis, which was caused by a single powerful factor. Alcohol – regular consumption of alcohol is the main cause of chronic pancreatitis in both developing and developed countries. At first, the disease usually presents itself as an episode of acute pancreatitis, which then transforms into chronic pancreatitis. 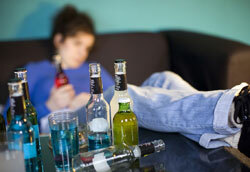 Usually only prolonged overconsumption of alcohol for 5-10 years causes the initial attack of acute pancreatitis. Isolated binges very rarely lead to pancreatitis. Also, there is a strong positive correlation between the volume of alcohol consumed and the risk of developing pancreatitis. This suggests that alcohol has a direct toxic effect on the pancreatic cells. Later studies have found that alcohol is also metabolized in the pancreas which creates oxidative stress. Moreover, it destabilizes the intracellular membranes of the pancreatic cells, which creates favorable conditions for autodigestion. Another discovery was that smoking tobacco greatly worsened the condition of patients with alcoholic pancreatitis. Smoking – multiple studies have shown the chances of chronic pancreatitis significantly increase in people that have been smoking for over 25 years. Also, the number of cigarettes smoked per day greatly influences the risk of chronic pancreatitis. On average, people that smoke suffer from chronic pancreatitis 4.9 times more often than those who do not smoke. Risk of diabetes, calcification, and especially pancreatic cancer in smokers is also much higher than in non-smokers. Malnutrition – people in developing countries who suffer from malnutrition often develop chronic pancreatitis. Currently, it is unknown how malnutrition triggers chronic pancreatitis. However, it is widely accepted that chronic pancreatitis itself can cause malnutrition due to decreased excretory function of the pancreas, which leads to maldigestion. Hereditary – hereditary chronic pancreatitis is a very rare form of chronic pancreatitis that is characterized by early onset and slow progression. Aside from those two facts, hereditary chronic pancreatitis is indistinguishable from alcoholic chronic pancreatitis. Treatment and diagnostic criteria for it are also exactly the same. Trypsinogen and inhibitory protein defects – can sometimes lead to activation of proteolytic enzymes within the pancreas, causing either an episode of acute pancreatitis, or more commonly chronic pancreatitis. Cystic fibrosis – leads to formation of fibrosis and cysts within the pancreas (along with other vital organs), which leads to chronic inflammation. Also, all secretions of the body including digestive juices become much more viscous. These digestive juices can block the excretion of digestive enzymes from the pancreas, resulting in irreversible damage. In some cases pancreatic ducts become completely obstructed which leads to atrophy and progressive fibrosis of the pancreas. Cystic fibrosis happens to be the number one cause of chronic pancreatitis in children of United States. Trauma – direct damage to tissues of the pancreas may lead to chronic inflammation causing chronic pancreatitis. Hypercalcemia – is an increased concentration of calcium within the bloodstream. This condition can be caused by excessive skeletal calcium release, decreased renal calcium excretion, and increased intestinal calcium absorption. Hypercalcemia can induce pancreatic injury by causing the blockade of pancreatic ducts and accumulation of secretory proteins. It can also trigger activation of proteases within the pancreas. 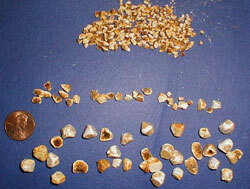 Calcific stones – are formed as a result of hypercalcemia. These stones can obstruct pancreatic ducts preventing the digestive juiced from leaving the pancreas. Autoimmune aggression – a rare but serious disorder during which the body’s own immune system is attacking pancreatic cells. This often leads to Type II diabetes as well as impaired excretory function of the pancreas. Other obstructions of pancreatic ducts that may cause chronic pancreatitis include benign and malignant tumors, and anomalies of the pancreatic ducts (especially pancreas divisum).